MASTERS Apr 1-7, 2019 - MAÎTRES - Host- Nuntana CC, Saskatoon Saskatchewan ! "Welcome - Bienvenue " ! Thanks eteamz+ Active.com for web support !
. .great since 2000 - ! Canadian Masters Curling Championships ! Championship Finals at "The Masters Nutana"
A WCT and now Canadian Masters Sponsor ! Men AB defeats NO 8-4 for Championship Gold ! . . . . .Team Pendergast wins '19 and '18 Canadians Back to Back ! Women SK defeats. BC 8-7 for Championship Gold ! 26 teams Qaulified for the 2019 Masters Championship ! Playoff Semis . . . Bronze ( M) SK defeats BC and ( W) NB defeats ON ! 2020 Location announced ! read NB & Riverside CC info below . . .
Media Release info here ! . . check out the headline story on Global ! Try the Voice feature impressive ! Phone: Call (306) 374-2422 & note Cell 306-713-1588 is textfriendly ! 2020 Flash News Alert - Host New Brunswick announcement ! Canadian Masters with a second club in Saint John being used as required. Adib Samaan will be the event Chair. Provincial Masters Playdowns 2019 are completed ! - Provincial Champions- travel well and curl well at the Nutana CC! . .
Best of Canadian Championship Curling again in 2020! Consider volunteering to help Masters Curling Thrive on the Web . Thx. The Chase to qaulify for the '19 Canadian Championship is ON ! If you Missed the Q in'19..ramp up your 2020 team now . Host Riverside CC in NB . - Reminder, Association executives and team members, please complete and send all of your Masters Champions data to the 2019 Masters folks in the Nutana CC as your playdowns wrapup. All live Event info is Through the Nutana CC . The Champions and finalists will later be listed there. So have a great CurlFest all, at the Masters Canadians '19 ! Each win helps your province win The Cup ! Flashback- 2009 Masters @ Nutana's Lee Morrison wins! 4 Teams tie for 1st place. Thx host Nutana CC Clik to view. Win your province and bring your "A" game to Nutana 2019 - Masters Champions Pendergast '18, Hackner '17,Hritzuik '14 all have won WCT events at this famed Club in Saskatoon. Thx College Clean Restoration for building Masters Curling! 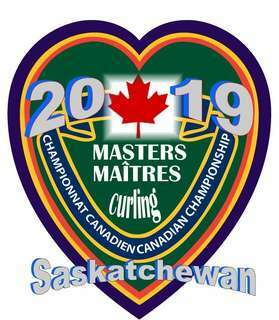 Thank Nutana members, Saskatoon City and all Volunteers& Sponsors for hosting The '19 National Masters! Humbolt Community Support. . .
- Thoughts of Peace, Strength & recovery. . .
Men AB wins over BC (8-2) for Championship Gold ! Gals BC wins over SK (8-4) for Championship Gold ! The Canadian Masters Curling Champions 2018 ! In memoriam: Lorraine Gagnon passes Jan 1 2019. Condolences are offered. Thanks Canada ! Check in and Clik back often ! Support Masters Curling ! RESULTS and information - Short Cut Just CLIK here ! ___Thanks WHITEROCK and SURREY for Supporting 60 + Athletes_____ . The 2018 Masters Gold, Silver, Bronze & Playoff overview ! GOLD The BC Women’s team of skip Pat Sanders, third Lorraine Gagnon, second Sherry Findlay and lead Roselyn Craig won gold by defeating the 2017 defending champion Saskatchewan team of skip Delores Syrota, third Beverly Krasowski, second Donna Liebrecht and lead Sylvia Broad 8-4 to win Women’s gold 2018 ! Bronze - Nova Scotia’s Colleen Pinkney won Bronze defeating Ontario 6-4 in the women’s bronze medal game. Meanwhile Rob Koffski’s BC-Host team, Pat Ryan Vice, Randy Nelson 2nd with Glen Brennan, beat Manitoba’s Matt Franklin squad 3-1 to win the men’s bronze medal . The Masters Awards banquet had Team PEI’s Craig Mackie as the men’s sportsmanship award winner with Ellen Johnson from the Yukon the women’s choice. The players Choice's. Thx PEI Web site for the information recap. April 9, 2018. A Note about history in the making. BC Lead Roselyn Craig won the Canadian Masters 2018 and tossed her rocks with a stick , so it is thought that she is the 1st athlete to do so! Congratulations Roselyn ! Double Hall of famer Elaine Jones of MB as a skip reached the Masters finals X2 ( with a stick delivery) and was the forerunner of this athletic achievment. These athletes are allowed to compete in the Canadian Open Curling Championships ! Saskatchewan Nutana Hosts in 2019, followed by New Brunswick 2020 & Manitoba in 2021 . . Contact SaskCurl for the National details re Host Club and 2019 details ! Congratulations - Leader Mike Carson ! Season of Champions Fact Books- Check Past Masters Champions -CLIK ! Hy-Grade Steel Roofing 2017 Canadian Masters Curling Championships. IMPORTANT. MOVING FORWARD from 2017 into 1918 and beyond ! 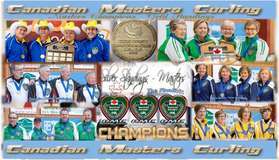 For any information about Provincial and the National Masters Championships please contact your provincial curling executives who for 2018 and on will provide the stewardship for this championship. The past volunteers of the National Masters (60 + athletes) thank all athletes for your past, and future participation in this important Canadian Championship ! It has been our pleasure to serve from 2007 through 2017 alongside the local hosting clubs, sponsors, athletes, and curling executives all across Canada who make this event viable! You can volunteer ! feel free to contact your local Club, Provincial or National Governors. Keep building Masters Championship Curling in Canada - it has been in place since 1986 ! Call now and help run this event and maintain this historical website. You can help by inputing the data for each years event and help honour the Masters athletes who participate ! Merci and Thanks . . your Canadian Masters National Committee volunteers 2000- 2017! Masters Brushing Matches the Seniors and other CC National Championships. Players and coaches are to ensure that any sweeping brush/pads brought to the Masters arena of play are compliant withThe Curling Canada Sweeping Moratorium . Volunteer and help maintain this website ! It houses the historical data that forms a large and valued part of Canada's Curling History. 2016 Canadian Masters Curling Championships in Nova Scotia. 2016 champions Alberta and Saskatchewan Lukowich and Kopach Click link to view photos' and info ! 2016 Masters Curlers say ‘Thanks Kathy Siddall ( Curl Canada Award winner) and Tony Stirling alongside the Valley volunteer’s of Glooscap ( Kentville CC) and Wolfville CC! This gang of volunteers put together an awesome event – Outstanding !..and raised rat lot of Cash for Valley curling. Canandian Masters Champions - The Best of the Best ! Masters Curling, like the Brier and other Canadian Curling Championships, is hosted annually in provinces across Canada. . The efforts of the host locations have been the key in developing successful Masters Curling Championships ! 2018 - Event Manager, Nigel Easton Co-Chairs Susan Martin (Cloverdale) & Darrell Zbeetnoff (Peace Arch). Masters athletes from all across Canada can qualify for the Canadian Masters National Championships by joining a curling club, entering "The Masters" and then winning their respective Provincial or Territorial Championships. Thanks to the Host Volunteers - Fantastic Support ! 2015 NVD MASTERS CHAMPIONSHIPS, WHITEHORSE CC - Yukon! Thanks Whitehorse - See you all in the Yukon - please visit when you can ! Presenting Sponsor NVD Hotel Divison ! Masters Champions of Canada, ONTARIO wins Gold ! This Team from Ottawa ( Silver winner in 2012) ran up a record of 9 and 1 through the RR and the playoffs and takes home the gold medals ! Double winners Joyce and Janelle are also Canadian Senior Champions from a few years back. Congratulations Team Ottawa, Team Ontario, now Team Canada ! Well done ! Since returning to curling 15 years ago, Potter has won nine Ontario championships - two in the intermediate division (1999 and 2001), four seniors (2003, 2005, 2009 and 2011), and three masters (2011, 2012 and 2013). Her provincial achievements qualified her for seven Canadian championships, which produced two gold, two silver and one bronze medals as well as two fourth-place finishes. She won gold at the national seniors in 2005 and the 2013 national masters in April in Thunder Bay, Click the link for the full article . Congratulations Team Calgary, Team Alberta, now Team Canada ! Well done ! Team Breckenridge goes into the record books as the first Alberta team to win the Canadian Masters Championship(M).This powerful Team from the Inglewood CC in Calgary Alberta sports a undefeated record at the 2013 Masters Championship. That record goes really well with the Gold Medals, along with getting thier names engraved on the Masters Champions Shield of Honour. At least two members of team Breckenridge played well in the Soo Brier when Ed Werenich won ( 1990) so Harold,Jimmy MacD and company now have many more special memories about Canadian Championship Curling in Northern Ontario,especially about the Port Arthur Curling Club In Thunder Bay ! Ontario was not going to take the Canadian Championship away from team Alberta this time as Team Alberta defeated Team Ontario in both the RR and the Championship game in 2013 ! Canadian Championship curling - Where dreams and hopes can be fulfilled ! We wish team Breckenridge best of luck in 2014. A repeat the win on home turf in 2014 would be sweet as The Masters Canadians are Hosted by Coaldale Alberta in 2014 ! Media Link - Courtesy Calgary Sun - NATIONAL CHAMP AT LAST ! 2018 CANADIAN MASTERS-Lost out in 2018 ? Win your zone, region, province. Shoot to 'Win Gold at the Canadians' ! Put your 2019 & 2020 Masters team together now . The players choice 's ! Recognized at the players National Banquet annually ! - MASTER CURLING ROCKS! ...by the numbers ! Did you know that from 2007-2015 > > over 3700 Masters teams have entered the Master Playoffs with a dream of Victory. Support Masters Curling - Enter your team in the Play-downs. Grow the Championships ! MASTERS CURLING CONTINUES TO GROW ! GRAND MASTERS CURLING TAKES OFF . . Now a Curl Ontario Sanctioned event ! These CCA publications honour the Canadian Masters Curling Champions. HAll of FAME - ONTARIO GALS two time Canadian Champions ! 2019 CANADIAN MASTERS - Watch here for this exciting location in Saskatchewan. Finalists - Toby McDonald of Newfoundland wins over Lawren Steventon of Quebec . Finalists - Merle Kopach of Saskatchewan wins overrJoyce Potter of Ontario. 2012 Championship Standing - Quick List - CLICK THIS LINE FOR RESULTS. 2012 Championnats de curling des Maîtres Flashback info ! Thanks - Merci ! "Boucherville + St lambert " ! Provincial and Territory Masters Championship Curling Athletes ! Hello Canadian Masters Curlers ! Plus if you have had your picture taken with the Watson Shield ( 1987 to 1999) please forward a copy. The Asham WCT and Capital One Grand Slam of Curling, are pleased to assist the continued development of the Masters level within our sport. The Masters players have laid the foundation for the Olympic athletes of today, and this is our way to say “thank you!” Our assistance with this National Championship is something that makes all players on the Asham WCT proud !... ( 2008 and 2007 Press releases - Asham World Curling Tour Sponsorship) Masters Curling says 'Thanks World Curling Tour' for supporting ! The Masters Canadian Championship was sanctioned by the CCA delegates at the 1999 AGM. Exopected soon CC stewardship and operational guidance and equitable funding. The future of Canadian Masters Curling Championship requires the resources of the CCA, the Provincial Associations along with existing support groups . Sponsorship development will strengthen further as the full resources of the CCA and Member associations are applied to the Canadian Masters Championship Event. The Masters is now a part of the annual CCA Congress process. Masters Curlers thank the efforts of The Canadian Masters Committee Members and the Championship event volunteers , who alongside the event sponsors make this event a reality each season ! Masters Curling -Since 1987 ! - Across Canada from year 2000 to present. Click Canadian Masters Tab for all Masters Champions ! NOTE: This is an information site about Masters Curling in Canada. Historical data is posted from time to time as it is collected from competitors, volunteers and other sources. Accuracy is work in progress and is maintained as well as data sourcing permits. Additional details about the Canadian Masters Champions, Finalists, Semi-finalists, participating players and RR standings is welcomed from persons who can supply data for this Masters historical data base. The vision is to have this "Masters Collection" information placed on web sites such as Canadian Curling Association or the other Member associations. The Canadian Masters Champions have been featured in CCA publications ( Extra End Mag and Annual fact Book) since 2008. Note: No liabilities are assumed by the volunteers. Corrections and updates are welcomed. All rights reserved. Please request permission to use any data from this site. Thanks to all persons and sites who have fowarded data so far. Enjoy your visit ! Copyrite from 2008- 2012 plus ,the day- night you might visit this web-site. Masters curlers from 2007 to 2011 number over 2050 teams who have entered Masters playdowns.That is over 8200 curlers who have said YES to MASTERS CURLING CHAMPIONSHIPS. A much bigger number of participants exists if you roll back and add in the teams and players from 1986 through 2006 ! Beyond the Championship playdowns , it is thought that 60 + curlers form the backbone of most/many curling clubs in Canada. Canadian Masters Committee - Please Click this line for information. If you are able to serve as a member of the Canadian Master Championships Committee please contact the CMCC Chair (Mike Carson) or Elaine Jones in Winnipeg..
note: No liabilities are assumed or will be assumed by the CMCC or the volunteers. CMC is a voluteer group of individuals building Masters Curling in Canada. Copyright properties are in place 2000-2013. Thanks to all sources for the courtesy of any or all shared info that may be posted on this site. Masters Curlers thank all contributors of content forwarded and posted. Should you wish to assist on keeping this site alive with donations of time or $$ or company sponsorship , please contact Chair Mike Carson. ( easy to do..visit the committee page ) Enjoy your time on the CMC Web !